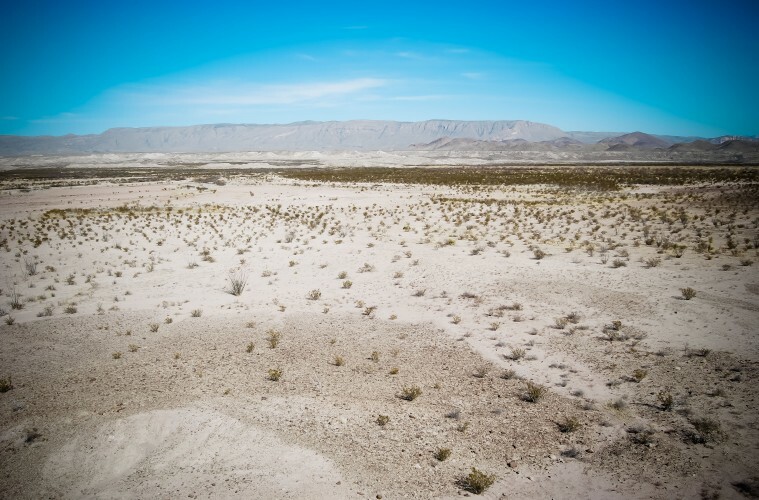 “The Valley of the Shadow of Death” is a brief meditation on the refraction of sunsets over desolated landscapes, photography of war, and the viewer’s relationship to the death of the sublime. 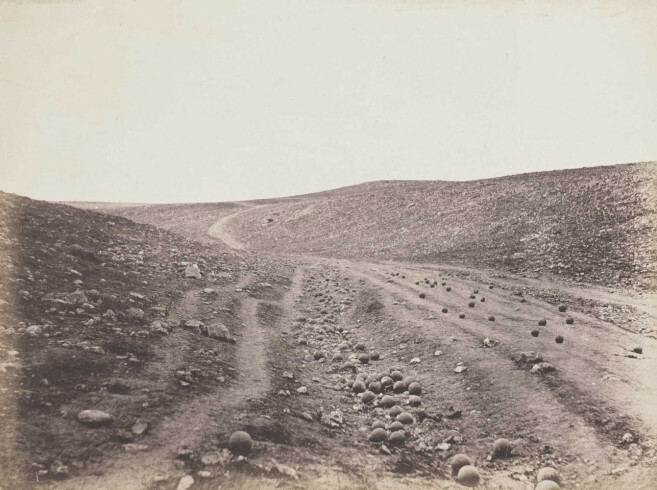 The essay references the Museum of Fine Arts Houston exhibition “WAR/PHOTOGRAPHY: Images of Armed Conflict and Its Aftermath” (2012-13) citing one of Roger Fenton’s famous manipulated pictures from the Crimean war (1856) showing an empty landscape with cannonballs. Cet article est une méditation brève autour de la réfraction des couchers de soleil sur des terres désolées, de la photographie de guerre, et le rapport spectatoriel à la mort du sublime. S’y trouve une référence à l’exposition « WAR/PHOTOGRAPHY: Images of Armed Conflict and Its Aftermath » (2012-2013, Museum of Fine Arts Huston) qui cite une des photographies manipulées célèbres de Roger Fenton sur la Guerre de Crimée (1856), illustrant un paysage vide avec des boulets de canons. Fig. 1 Roger Fenton, The Valley of the Shadow of Death, Crimea, Russia 1855. Courtesy of MFA Houston. 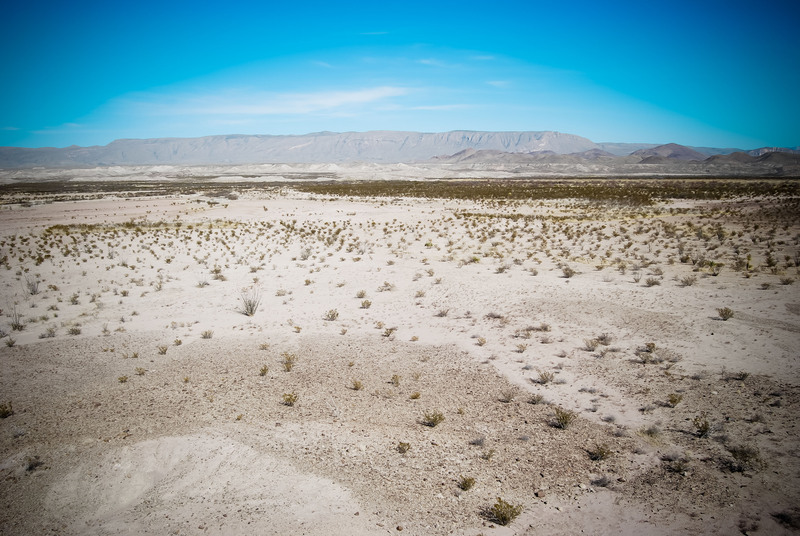 Returning to Houston after a week in the desert mountains of Big Bend (Texas), I struggle to remember the flashes of hallucination burnt into the retinae of my eyes. One night, patiently waiting for dusk, and standing atop a small hill, I stared for almost 45 minutes at the vast, endless sky as it turned kaleidoscopically from white yellow golden and red to blue pink and grey and saffron to black to the wordless and disenchanting realizations of a certain horror that is only enabled by what painters used to call the sublime. And yet we fail to recognize, perhaps, the physics underlying a setting of the sun in desert mountains, when tropospheric clouds enhance the scattering out and atmospheric refraction of twilight rays, when air molecules and particles affect colours and shapes that, in my hallucination, took on the form of a Kafkaesque wound –something dark red bleeding there in the distance, mocking my earlier view of the desert ground as I walked along the Croton Spring Trail fastening my eyes on tracks in the sand, dried mud, stones, petrified wood, remnant cairns, the desolate sedimented wash. There too, in that forlorn wash, I sensed the temptation of the metaphysical, glimpsing ghosts of the dead who were not present, no skeleton bones and no trace of violence to be seen except in the inner howl remembered from Pasolini’s Teorema, an aural violence I associate with war and its mythological waltzes with death and traumata unhealed. At the horizon of the desert, where volcanic formations rise up as if beckoning from the other side of life, the landscape stares back as a massive dead body. The desert floor, now, for me in this trailing becomes the uncanny scene of animated film, alone I am naked, slowly trying to put my clothes back on, as if stepping into Ari Folman’s Waltz with Bashir into voices that recount heading into an imaginary Beirut emerging from the sea of forgetting, the clouds scudding above a radioactive yellow land throbbing with the electric guitar sounds or machine gun fires that stopped long ago and yet are heard in the perennial soundtracks of our civilization of war. My trail in Houston takes me to the Museum of Fine Arts and its current exhibition, WAR/PHOTOGRAPHY: Images of Armed Conflict and Its Aftermath, not suitable for children or the faint of heart, a gathering of nearly 500 objects including photographs, books, magazine, albums, and writings spanning six continents and almost two centuries of atrocities, evidences and fictions mingled with first-person accounts, hand-written thoughts and captions that seek to frame the brutally obvious or the obscure, the real and genuine and faked/staged and equally unspeakable reconnaissance captured, for example, in Roger Fenton’s The Valley of the Shadow of Death, with or without cannonballs. Believing is not seeing the cannonballs or rocks or the desert but imagining yourself in the arrangement, naked putting your clothes back on if you can to hide the wounds that are caused by the relationship you have to Imaginative truth, to what you hear when you listen to the electric guitar, the voices or the machine gun fires, the exploding grenades under surveillance by our drones which capture the landscape from above, google-like, instantly tacitly implying the virtual – now setting a standard of authenticity and the sordid sublime to which the real is obliged to aspire if it is able to. My closest friend, who accompanied me on the Croton Springs Trail, is a painter of landscapes, forever inspired by Caspar David Friedrich who knew little of the desert we just saw but looked to survey a rough sea and a gray, blank sky (The Monk at the Sea) in a process of reduction – this desert or valley of the shadow of death takes up most of the picture, as if emptiness and our desolation have become the only feasible Metaphysics, proper to mankind gazing blindly at the destruction it does not seem to fathom. Then what is a trail? Or if we think of the museum and its exhibition of the maimed and the raped and the killed – “unaccommodated” humans (dramatized in Samuel Beckett theatre of operations) – what is the renunciation required from us? The longevity of volcanic rock , quietly under the wounded skies, points the way for us.